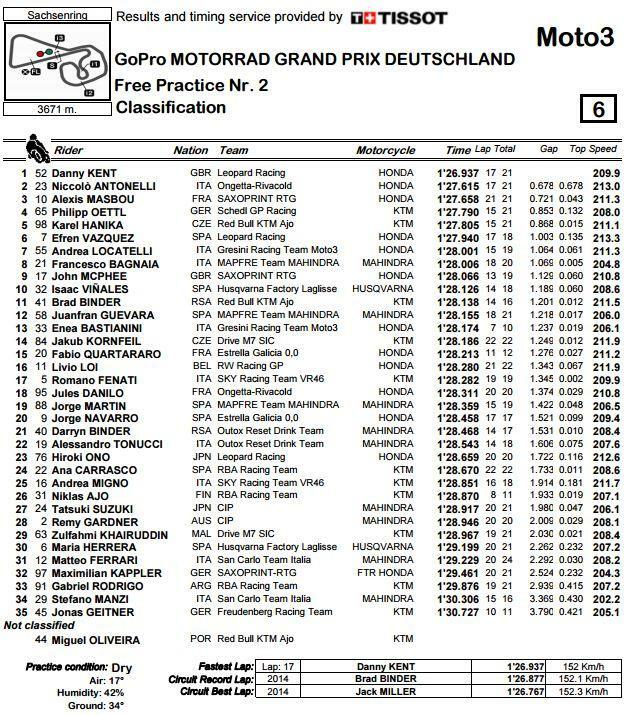 Danny Kent once again laid down a marker to the Moto3 field by maintaining his six tenths of a second lead from the field at the Sachsenring. Kent is in the form of his life and looking more and more comfortable with the mantle of pacesetter and favourite. When he has needed to he has been able to set a pace unmatchable by anyone else today. Niccolo Antonelli was second in a session where Kent was the only regular front runner inside the top five. John McPhee was a very encouraging ninth fastest with the Scot setting his fastest time midway through the session. Kent's title rival Enea Bastianini was 11th fastest.